So often the focus of a wedding is on the bride. Her wedding dress, her hair, her shoes, and her jewelry are often what guests are waiting to catch a glimpse of when she walks down the aisle. And usually, a lot of money is spent on the bride’s beautification in preparation for the big day. Then you’ve got the groom. No one gets excited before the wedding thinking about what he could possibly be wearing. Most men’s formal wear looks just about the same. So does it make sense to spend big bucks on what guests won’t even notice or appreciate? Are designer duds really worth the extra dough? Here are 12 ways that you can get a bargain on wedding wear for the groom and groomsmen without compromising style. Before you rush out and rent a tux, sit back and think about whether or not a tux would be the most appropriate type of formal wear for your wedding venue. If you’re having a beach wedding, for example, a pair of khaki pants and a linen shirt might be more appropriate. Suits are a new trend in wedding fashion for men. They can look just as handsome and put together in a finely tailored suit, as they can in a tuxedo. It may also help the groom relax a little more and have more breathing room than being in a stiff tux. That being said, suits are also expensive so unless you already have one or can get a great deal on one, a suit may not save you that much money over a tux. Just as with the bride’s wedding gown, a groom only needs a tux for one day. Consider asking friends and family members if they have a tux that you can borrow. Most people would allow you to borrow theirs for your special day. 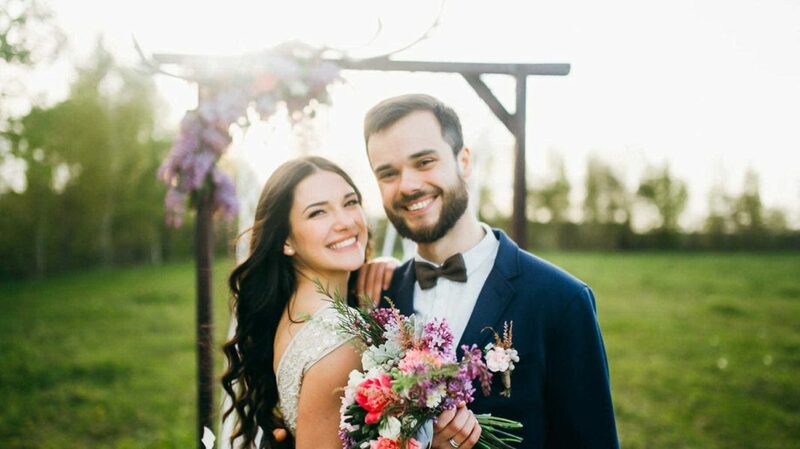 Just make sure you appropriately fit the borrowed tux because it could make for an awkward situation to be wearing a too small or too large tux in front of your beautiful bride. When I got married, I was surprised by the price of tux rentals. In fact, tux rentals can be so expensive that you may be able to purchase a tux for less than the cost of renting. Make sure to ask about this as you shop around. Also check out eBay and Craigslist. If you do buy a tux, you can then resell it afterwards. Typically, groomsmen pay for their own tuxedo rentals. However, most frugal people not only want to save money themselves, they also want their friends and family to save money as well. By cutting down the number of groomsmen you have, you are saving your friends and family money. Make them ushers instead, which will not require them to dress as formally. When my husband and I were shopping for tux rentals for our wedding, one thing we found was that not all men’s formal wear shops are created equally. While the tuxedos looked very similar, especially at a distance, the price of rental varied greatly. Make sure you shop around and go to all of your local men’s stores to find what stores have the best bargains. It is great to know what you want when shopping for a tux or some other type of formal wear. However, it is better to be open-minded. The least popular styles and brands that are rented less often may be at a discounted rental price. Everything that is rented comes with a price. The more accessories you rent, the higher your bill. Try to stick with the basics. If you own your own shoes or cufflinks, don’t waste your money renting any. Yes, it’s possible to obtain coupons for tuxedo rentals. In addition to searching the Internet, go to a bridal expo and visit the men’s formal wear booths. Also, contact your local rental stores and ask if they know if there are any coupons available. Try renting all the tuxedos needed for your wedding together to see if you can get a discount for multiple rentals. Ask if there are wedding packages for renting the groom’s, the groomsmen’s, and the fathers’ tuxedos. At our wedding, my husband got his tux rental for free, because the groomsmen all got their tuxes there as well. Grooms should put nearly as much effort into looking good on their wedding day as the bride does, but that doesn’t mean they have to spend as much money. Look for ways to save on your tuxedo or formal wear. That way, you’ll have one less thing to stress about during the wedding planning process. What type of suit or tuxedo did the groom and groomsmen go with at your wedding? How much did it all cost?